A fast paced, city building, dice rolling card game. 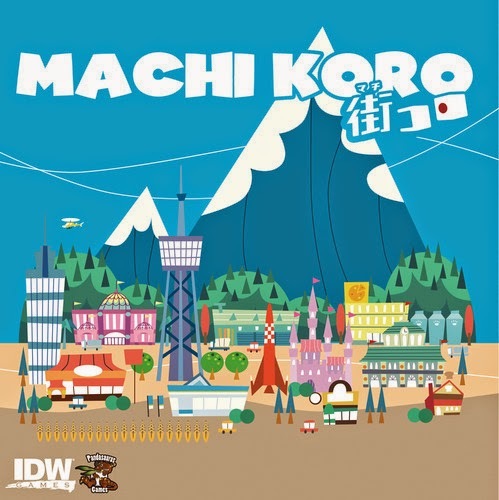 Machi Koro is a quick breezy city building game from Japan. The box says it’s a 30 minute game and with 4 players it might take that long. A 2-player game will be much quicker. The object of the game is to be the first player to activate all 4 of their landmarks. Players start with 2 basic establishments, 1 wheat field, and 1 bakery. Money is generated on each turn by a dice roll, if the roll matches the activation number at the top of an establishment. There is a series of additional establishments to buy. Their activation numbers run from 1 through 12. Their cost to purchase runs from 1 coin to 8 coins. Establishments are of 4 types. Blue establishments pay their owner on any player’s roll. Green establishments pay their owner only when activated by the owner’s roll. Red establishments earn other players money only on the other player’s roll. And, purple establishments take money from other players on the owner’s roll. A player’s turn consists of a die roll, receiving income on all establishments activated, and the option to one purchase an establishment, or pay to flip over one of their landmark cards. At the start of the game each player will roll 1 die. Seven establishments require rolls from 7 to 12 to activate. When a player pays to flip over their Train Station Landmark they will have the option to roll 1 or 2 dice on each turn. It may be beneficial for a player to continue to roll only 1die if their 1 through 6 establishments are stronger than their opponents. Or, it could be beneficial to roll both dice if a player’s 7 through 12 establishments are stronger. Buildings activated by rolls of 7, 8, and 11 or 12 pay based on other establishments owned. For example, establishment 7-Cheese Factory pays 3 coins for each Ranch establishment that player owns. Each of the other Landmarks gives the player an ability once it has been flipped. Establishments and Landmarks can be purchased in any order. Once the Train Station Landmark has been flipped over, players can choose to roll one or both dice. The dice provide an element of luck. However, in order to win a player will need to build an economic engine or significant worth to buy their way to victory. This game is quick. It is easy to teach and it is a lot of fun. The Harbor Expansion (sold separately) adds a bunch more variety in establishments to buy and 2 new Landmarks to complete. 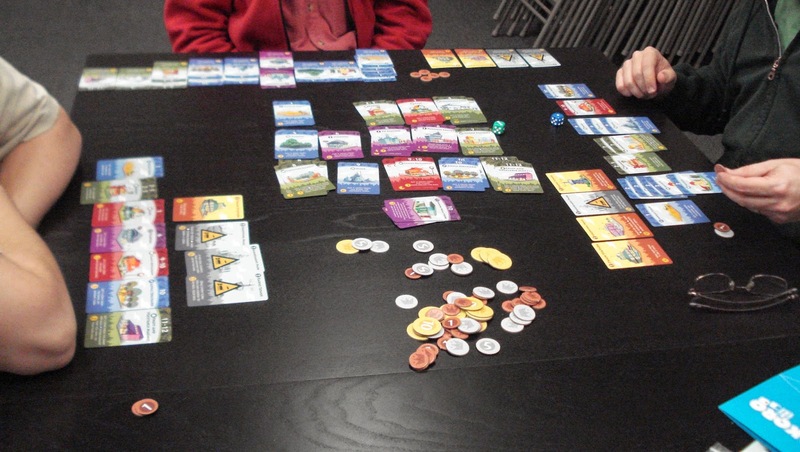 We have an open copy of Machi Koro available in our Demo Games Library for you come in and try.